The first thing you'll probably notice is that Erie Shore Winery is not in Napa. Any self-respecting cartographer will notice that longitudinally and latitudinally, a wine region around one of the Great Lakes has more in common with Bordeaux than with the mythical sunny California wine nirvana region of Napa Valley. That little fact doesn't suggest that Canadian wine resembles either of the wines from those regions. Canada is not one of the world's leading wine regions, but it has a long history in the New World wine industry, starting in the 1800s. It's really since the 1980s that Canada's wine industry has started getting attention from the wine experts or at least getting them to raise their eyebrow in acknowledgment. Canada's wine industry is barely a sliver in a pie compared France, Italy, Spain, United States, Australia and South America. It's easy to see why though, the country gets more than its share of ice and snow that flows down from the Arctic. It's a tough stage to produce wine of any kind or quality but somehow, the stout-hearted Canadians manage. Their growing season is short but the hot summer compensates and enables them to grow grapes, although those tend to be of the cooler climate varietals such as, Riesling, Chardonnay, Cabernet Sauvignon and Cabernet Franc. There are emerging areas that are experimenting with Syrah, Gewurtztraminer, Sauvignon Blanc and Viognier. Don't expect too many majestic Cabs or sultry Pinot but don't be surprised either. 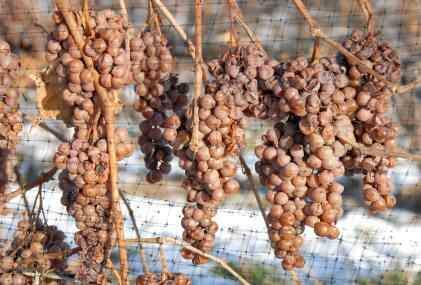 One type of wine that Canada is known for is Ice Wine, that German style sweet white wine concoction from late harvest grapes that gets dusted with snow and ice...makes sense to me. In Canada, it is usually made from the Vidal Blanc grape. For more information, visit The Canadian Vintners Association, a wine industry trade group that provides information about Canadian wine and winegrowers. There are four primary wine regions: Ontario, British Columbia, Quebec and Nova Scotia. The Erie Shore Winery is located in Ontario in a Designated Viticultural Area (DVA) known as Lake Erie North Shore. It can be found on the north shore of the lake about 25 miles from the city of Windsor, Ontario, right across from Detroit, Michigan. The Lake Erie North Shore wine region, while not big with approximately 500 acres of vineyards, does produce some of Canada's best wine. As you may suspect, there are few large wineries in Canada and the majority are smaller in scope with most being family-owned and operated. Such is the case for Erie Shore Winery, it's owned by Harvey and Alma Hollingshead. The winery was founded in 2002 and the Hollingsheads celebrated their winery's fifth anniversary at the end of 2007. The winery is close to the Erie shore in the town of Harrow and is considered Canada's southernmost winery. Here the Hollingsheads grow several grape varietals that are 100% VQA. That's Canada's wine regulatory system similar to France's AOC or Italy's DOC regulatory body that controls wine quality. The symbol on a wine's label means the wine has been tasted and adheres to these standards. The Hollingsheads take winemaking seriously. Their efforts begin in the vineyard and carry through to the end result in a bottle. Although young, Erie Shore has garnered critical awards and consumer acclaim. The following are some examples of wines you will find at Erie Shore. One thing you'll notice is a preponderance of hybrid grapes used due to the harsh realities of Canada's climate. Vidal Blanc - A French hybrid (cross between Ugni Blanc and Seibel) that is commonly grown in the eastern U.S. and Canada. Blanc de Blanc - A white blend that is crisp and citrusy. Baco Noir - Another French hybrid commonly found in Canada and U.S. east coast. This is a fruity light-bodied grape reminiscent of gamay. Ridge Red - This is a blended red again made from French hybrids, Baco Noir and Chambourcin, a ruby-colored aromatic red often used in Rosé wines. Vidal Icewine - This is not Germany so the Canadians use the English translation for Eiswein. It's a rich dessert wine with tropical and stone-fruit flavors and honey. Note that the winery can only directly ship within the Province of Ontario but if you are in the Detroit area, it's only a short drive to Harrow to get a taste of Erie Shore wine.